An ongoing series of ‘somethings’ from ‘nothings’. Something beautiful made from something discarded – a mere nothing. These pieces were each made from a small patch of handmade quilt. In times of ‘make do and mend’ when a quilt became worn it was mended by stitching another layer of fabric over the top of the worn piece. Whenever I come across such treasure, I can’t resist excavating – unpicking the top layer in places to see if there are others hidden beneath. Several pieces of quilt were gifted to me by a friend. Known to her family as the ‘grotty quilt’ because it was worn and stained and in very poor condition, it had lain around at home for years. Unpicking the top layer revealed delicate, shredded fabrics underneath. Different fabrics in different places as each worn piece was patched before a final layer of fabric was stitched over the top to completely re-cover it. 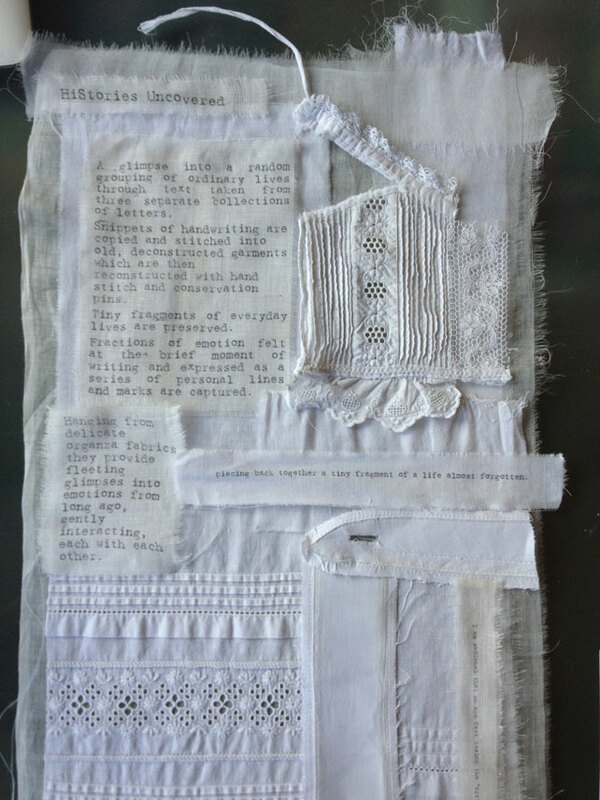 Each ‘Something’ is made from a small patch of the ‘grotty quilt’ using the fabrics discovered as that patch is excavated. As it was a much loved childhood quilt I added text from old letters from a mother to her children. The words in the letters reflecting the love and attention behind the hand stitching in the original quilt. 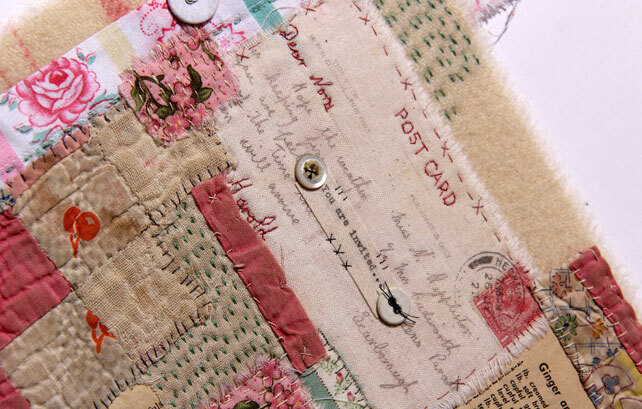 Each piece is hand stitched with vintage threads onto a background of old blanket or darned and patched linen. Somethings Sample by Ali Ferguson. Somethings Two Detail by Ali Ferguson. Somethings One by Ali Ferguson. Somethings One Detail by Ali Ferguson. Somethings Two by Ali Ferguson.